Spring is awesome of course, but there’s a shortcoming that I think the Spring team could eliminate with some modest work. I know it can be done because colleagues Jon Wolter and Lucas Ward did it at a ThoughtWorks client site after I had discussed it with them. The shortcoming I am talking about is the lack of support for collaborator components for request mapped injections. I’m not going to explain how Spring can be enhanced to allow it, just why it is desirable. 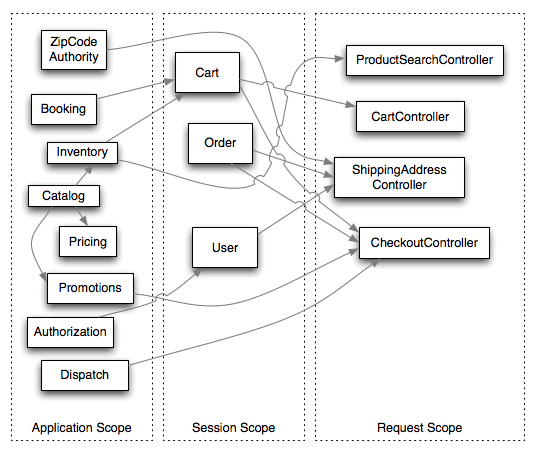 The symptom of the problem is the presence of an inheritance hierarchy for controllers. In the Agile age of course we prefer Composition over Inheritance. (Application Scope has another name in Spring, but I can’t bring myself to say it). “Red Lipstick #59 really goes with Dremel ‘MiniMite’; So says 93 customers. Just $4.99<buy it, you know you want to>”. 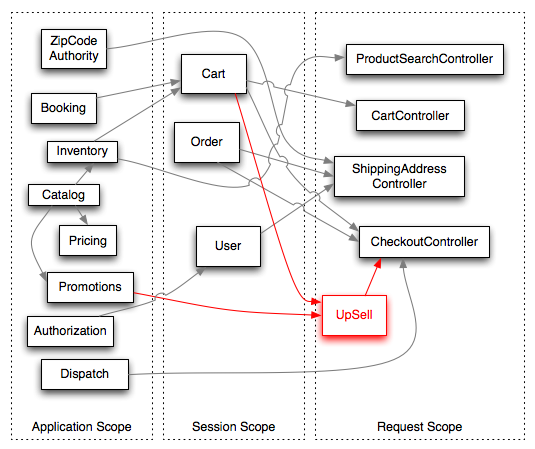 The CheckoutController may have a bunch of dependencies at the instance level (Cart, Order, Promotions). Cart was created and filled by some other controllers interactions from previous HTTP requests. Given this is a checkout action, Order is now being created from Cart contents, and having other related data filled in over a series of interactions. We see that UpSell is a request scoped component. That means its lifecycle ends with the request. If the user chooses to buy it too after being enticed by the message, then it goes into the cart as a regular cart item. Thus, it is not a session scoped thing, it is another transient request scoped thing. Being request scoped, it can take advantage of direct injections of what it needs. What we found was that Spring did not want to take arbitrary request scoped components in the method parameters of a request-mapped method. In my opinion it should do, so Jon and Lucas went about making it work and caching instances at that scope for the duration of the request. The created another annotation @AutowiredHandler and used that at the method parameter level. Spring still did its thing at the constructor and setter injection level, but there was suddenly one more place where injections of suitably scoped components could happen. You will note of course that UpSell is a subjective thing. For UpSell the team created a UpSellFactoryBean (that took dependencies) that would create the UpSell instance that would be cached for scope and injected where needed. This way different end-users would receive different UpSell instances as required. Inversion of Control recommended thinking about SoC when engineering larger component-based systems. SoC makes for better de-composition or componentization of an application. 3) Less inheritance for Spring Controllers. When service lookups begin to affect multiple Spring controllers, you’ll see such access logic migrate towards parent classes. We’re all preferring composition over inheritance these days right? Creating the collaborator UpSell and its factory bean mean we get closer to (1) and (2), which makes Agile developers at least happier. There are other considerations. One is what to do if no UpSells are appropriate or the Promotions Service is failing presently, but the checkout should continue regardless. In this case there are choices. One would be static instances like UpSell.NOT_AVAILABLE and UpSell.NOT_APPROPRIATE. This is a workable solution but it would would lead to some unsavory if/else logic somewhere downstream. Better perhaps is some functor/visitor logic in UpSell that does not require conditionals in page logic. Lastly, many folks would engineer their dependency-injection apps to have the maximum amount of components registered at application scope, and this request scope design would be alien to them. There is also the aop:scoped-proxy scope which is more transient than request, but feels hacky to me.